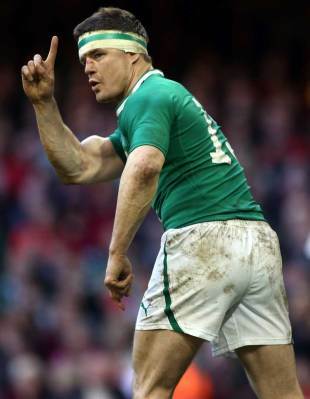 Ireland's Keith Earls believes Brian O'Driscoll could still be a key figure in the side at the 2015 Rugby World Cup. O'Driscoll, 34, has hinted that this year's Six Nations could be his last but a dazzling Man of the Match performance in Ireland's opening victory over Wales in Cardiff highlighted the fact that he remains one of the best players in the world. Staying fit remains his greatest challenge with the British & Irish Lions international having undergone surgery on the trapped nerve in his neck that dogged him throughout the 2011 World Cup and an ankle operation in the last two years alone. But on the eve of what will be O'Driscoll's 123rd Test cap against Scotland on Sunday, Earls has backed his team-mate to continue to defy his doubters and the passing of time all the way to the sport's next showpiece event. "Brian was amazing against Wales - I couldn't believe it," said Earls, who will start the Murrayfield clash on the wing in the place of the injured Simon Zebo. "The surgery on his neck has given him massive relief and you can see that in his body shape. "Now he's able to do weights, something he wasn't able to do for a couple of years. It's made a massive difference to him. I wouldn't be surprised if he goes on until the next World Cup - he's feeling fresh and is buzzing. "You get goose bumps when you're watching the video back of him play because in my eyes he's one of the best rugby players to have ever walked on a pitch. He has no fear, but is also very intelligent in the way he thinks about the game. His presence lifts you because you know he's willing to do anything for you and the team. It makes you want to do the same for him." Earls also believes Ireland have a wealth of younger talent that could serve them well in the coming years with fly-half Paddy Jackson and centre Luke Marshall the latest to step up to the Test stage having been handed their debuts this weekend. They follow in the footsteps of the likes of wingers Craig Gilroy, 21 and Zebo, 22 with the 25-year-old Earls considering himself one of the elder statesmen. "Brian, Rob [Kearney] and myself are the oldest now - it's a bit weird all right being only 25 but one of the oldest," Earls told PA Sport. "It's exciting times now, though not so good for me being one of the old lads! "It's great to see young lads coming through. The future's really bright and everyone's buzzing. The young fellas are keeping us on our toes and bringing a fearless attitude into the game, which is great. The squad has changed a lot since I first came in. Before the team never changed much."